Caroline Miles, who at 39 is a master teacher and has won numerous awards as ‘special teacher’ and ‘best teacher’, says the encouragement of mentor Emerson James rescued her from the jaws of poverty and placed her on the path to excellence. James, she states, is the “epitome of giving and of a selfless individual. He has been one of the most influential persons responsible for who I am today”. Miles met James as a pre-trained teacher at Seaforth High School in St Thomas where he was school chairman 12 years ago. Coming from a very poor background, she had attended Morant Bay High School where she won a partial scholarship from the Bank of Nova Scotia (BNS) for her outstanding work in art. This she secured with the help of arts teacher Michael Coates and principal Stanley Parkins. Miles notes that banker Roy Golding at BNS was also very helpful, assisting out of his own funds when the half scholarship was suspended. The 16-year-old enrolled in the Edna Manley School for the Visual and Performing Arts in 1986, first as a part-time student and then for the full-time diploma but dropped out by 1987 for want of funds. Miles explains that her mother, Elfrida Bernard, was a dressmaker with five children. This woman suffered from the influx of ready-made, cheap garments. Dad Sydney Miles died when Caroline was nine years old. Miles, was forced to leave Edna Manley, secured work at the St Thomas Parish Library in Morant Bay and then started working at Seaforth High School as a pre-trained teacher where she did well. Although Miles was young and without a diploma in teaching, she was recognised by the Ministry of Education for her work in these early years. She came to the attention of Chairman Emerson James. With James’ encouragement and influence, arrangements were made for study leave so that Miles could attend Mico Teachers’ College (now The Mico University College). personally transport me to the Errol Miller Hostel for my three-year sojourn as a student teacher,” Miles recalls. When school began in August 1999, however, there was no student loan forthcoming. Life became extremely rough and the high-school chairman came to the rescue by paying half of Miles’ tuition fees out of his own pocket. His commitment was again tested when, in her second and third years, Miles’ student loan application was denied because, she said, the loan officers said that the likelihood of dropping out of school was too great. When Miles decided that it was impossible to continue, James contacted principal of Mico, Claude Packer, and begged him to allow the student to remain in classes until arrangements could be made for payment of her tuition. A promissory note was put on her file from the Seaforth Community Development Association. 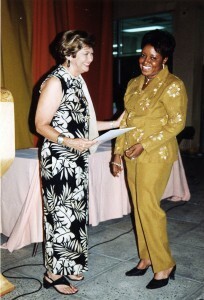 James, through the Seaforth Community Development Association, sourced funds for her tuition fees from the National Commercial Bank (Morant Bay), the Jamaica Public Service Company, Brown’s Town Funeral Home Limited, the Social Development Commission, the West St Thomas Trust Company and Dr William Brown. On graduation in 2002, Miles, who returned to Seaforth High School to teach and who has continued her education at Edna Manley College, is today a master teacher who continues to attract accolades for her work in arts. teaching by achieving excellence in current practice, as assessed by the Ministry of Education and Youth. Miles teaches visual arts, drawing, painting, ceramics, sculpture, graphics, surface printing, surface decoration and print making. Miles teaches grades seven, eight, 10 and 11. In the lower school, classes average 25 students. In the upper school, there can be as many as 60.
pre-trained teacher from deep rural St Thomas. Miles has been collecting best teacher and special teacher awards since 2003 and continued to do so in 2008 with the CVM television special teacher awards. On her résumé, the listing of awards, special accolades and prizes number more than 20. The teacher says her life has changed because of James, who still continues to push her boundaries. It is time, he told her recently, to hold a one-woman exhibition of her works. Miles states that James’ “yes, you can” mantra has changed her life forever. Share your story… Is there an Angel in your midst?